I first read A Wrinkle In Time when I was a kid, probably ten or eleven years old. I liked it. When I saw they had made a movie, I was curious. I reread the book. I still liked it. Then, I started seeing the reviews of the movie. They are mostly unkind. It has a 40% critics score and a 34% audience score on Rotten Tomatoes. But, I threw caution to the wind and went to see it anyway. Now I’m confused. It was a good movie. I’m not saying it should win the Oscar next year. I’m just saying that it did everything I need a movie to do. It had characters that I cared about doing interesting things. There was a definite plot with a satisfying resolution. The actors were good in their roles. It looked neat. So, why all the hate? Maybe the bad reviews come from people who forgot that it was a kid’s movie they were seeing. I see a lot of kid’s movies, having a daughter. There are a few great ones, like Paddington, but that’s the exception. Most of them are pretty awful, like The Emoji Movie. 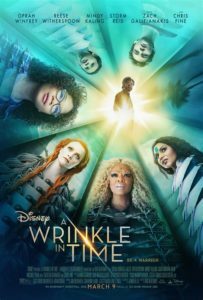 A Wrinkle In Time is a lot better than most of the kid’s movies I see. I feel like I’m giving the haters a big benefit of the doubt here, but maybe that explains the bad reviews. The only other thing I can think of is some combination of sexism and racism. It’s rare to have a movie with a female lead. It’s even rarer to find a movie with a person of color in the lead role. This movie has both with Storm Reid playing Meg Murray. I hate to think that in 2018 that’s too much for people, but we did just elect Trump president. I’ve heard that Black Panther has gotten artificially low scores because racist trolls are posting bad reviews of it. Could the same thing be happening here? I’m not saying everyone has to love this movie. Sci-fi isn’t everyone’s cup of tea. Maybe some people can’t identify with a kid who feels awkward and misunderstood. But, taken for what it is, it’s a good movie. It has a great message. And I would have said A Wrinkle In Time is an unfilmable book, but the movie keeps the feel of the book intact. Ignore the reviews and check it out.